Permitted for use in all school examinations in UK and Ireland. It benefits form dual power and a hard slide on case. Power SourceBattery / Solar. Key SizeRegular. Display SizeRegular. MPNDoes Not Apply. Dual Solar/Battery power. Larger display. Angled Large LCD Display for easy veiwing. This is a new 12 digit electronic calculator. We'll be more than happy to satisfy you. The jumbo desktop calculator operates on battery power for convenience. Requires 1.5v AG10 battery (included). We always thrive to be quick and help you to sort whatever is needed. We are always helpful and Kind. This is a new 8 digit electronic calculator. We'll be more than happy to satisfy you. CASIO FX991EX Advanced Scientific Calculator ClassWiz features 552 Functions. 552 Functions. KEY FEATURES. 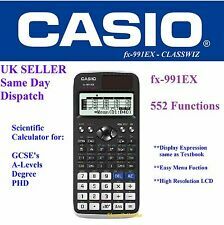 Casio Fx-991ex FX991EX ClassWiz Scientific Calculator LCD Display 552 Functions. Condition is New. Dispatched with Royal Mail 1st Class. The Casio MX-8B desktop calculator has a big 8-digit display and is ideal for use both in the office and in the classroom. With a dual power facility, the battery ensures the calculator goes on working even where there is no available light for solar power.Features. Casio FX-85GT Plus Scientific Calculator White. Condition is New. Dispatched with Royal Mail 2nd Class. Casio Fx85gt Scientific Calculator Plus - Blue. Condition is New. Dispatched with Royal Mail 1st Class. This pink desktop Casio calculator benefits from an extra large display that can display 12 digits. Checking order status. Calculator TypeBasic. Power SourceBattery / Solar. PRODUCT DETAILS. Display SizeRegular. BNIB Casio FX-85GT Plus Dual Powered Scientific Calculator 260 Functions Pink . Condition is New. Dispatched with Royal Mail 2nd Class. Casio (FX-83GT Plus) Scientific Calculator. Condition is New. Dispatched with Royal Mail 1st Class. This is a new 8 digit electronic calculator. Handy, pocket size. Display up to 8 digits. General Functions : Scientific Calculator. Type : Scientific Calculator. Fluid Power. Power Tools. View this range. Weight : 90g. Site Safety. Cutting Tools. Jumbo desktop calculator is dual powered and operates on both solar and battery power. Requires 1.5v AG10 battery (included). More features: 8 digit display, auto power off, pivoting display, square root key. The Casio MX-8B is a dual-power desk calculator with a wide 8-digit display. The calculator is both battery and solar powered and weighs just 300 grams. Features LCD Display. Display Size Large. Model MX-8B-WE. Also available in pink and blue colour options. It has 260 functions and is both solar and battery powered. Part of the UK's No1 Scientific Calculator range, the FX-85GTPLUS is a dual powered Scientific Calculator allowed in every UK exam where a calculator can be used. 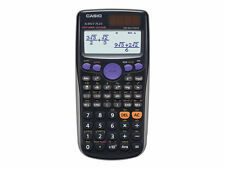 Casio FX-83GTX Plus Full Scientific Calculator 272 Functions GCSE A-Levels Exams. Condition is New. Dispatched with Royal Mail 1st Class. Pocket Notepad and Solar Powered Calculator With Pen Leather Look Adult Gift Fun. Perfect as a gift this useful pocket sized notebook includes a solar powered calculator and retractable ball point pen! Pivoting display for angled best view. Dual Powered With Solar Panel Or Battery. Operates on both solar and battery power for convenience. Desktop Calculator. Practical desktop calculator, 12 digits make it most useful for large calculations. Sturdy and durable -- the calculator are made of high-quality material and well constructed. Power: 1 AA Battery (Not Included). GIANT DISPLAY CALCULATOR-EASY PRESS-Large Screen Button-Desktop - Solar and battery powered. 19cm x 15cm. Big Display to read easily with big push good quality buttons. Battery included. 19cm by 15cm in size. 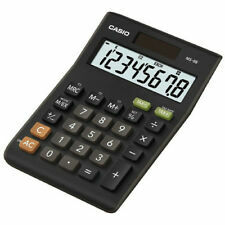 Casio Fx991es Plus Scientific 403 Functions Twin Powered Calculator. Condition is New. Dispatched with Royal Mail 2nd Class. Citizen12 Digit Desk Top Calculator SDC-888XRD. Battery & Solar Powered. USEFUL LINKS. Auto sleep mode. Square Root Function. Car Stereos. Fixed Angled display. kitchen appliances. BATTERY POWERED AND SOLAR POWER. DESKTOP CALCULATOR. STANDARD 8?. DIGIT L.C.D. READOUT. 1 EXTRA BATTERY FREE. BATTERY FITTED. BATTERY SIZE : AG10 aka LR1130. WHEN THE CALCULATOR IS LYING FLAT ON YOUR DESK. Solar Power - Adopting solar charging mode to prevent it from sudden power-off. 12-bit enables it to calculate as precise as possible. Furthermore, large screen displays data clearly with no data missing. Casio fx-85GTX Scientific Calculator. 276 Functions. Brand New. UK Seller. Solar & Battery Powered. Battery Included (1.5V AG10). Auto Power Off. Square Root Key. 276 functions; new functions on the 'GTX' model include Ratio, Digit Separator, Advanced Statistics, Advanced Tables and Variables List. Allowed in every UK exam where a calculator can be used. We hope you find what you are searching for. Q Connect Compact 8 digit Dual Powered Calculator with an extra large display. Supplied complete with wallet. Calculator with large eight digit display. Item model number: KF01602. Automatic power-off when not in use. CASIO HL-820LV HL820LV CALCULATOR - Large Display, Electronic - including cover. 7.5(H) × 127(W) × 104(D) mm (pocket size). New In Packaging Casio (FX-83GT Plus) Scientific Calculator. Condition is New. Still in packaging. I paid £9.99 for it. Dispatched with Royal Mail 2nd Class. CASIO FX-991ES PLUS ADVANCED SCIENTIFIC CALCULATOR FEATURES AND 417 FUNCTIONS. Two Way Power. FX-991ES Plus. Power source. KEY FEATURES. The FX-85GT Plus is dual powered (solar with battery back-up) and is available in a choice of colours. Dual power source - solar and battery. Statistical functions. ALSO COLLECTION IS NOT AVAILABLE. Casio MS8B Multi Functional 8 Digit Desk Calculator Dual Power Solar & Battery - New. 8 digit display. Extra Large display. Practical desktop calculator, 12 digits make it most useful for large calculations. The LCD display provides large, easy-to-read numbers for maximum viewing comfort. Sturdy and durable -- the calculator are made of high-quality material and well constructed.